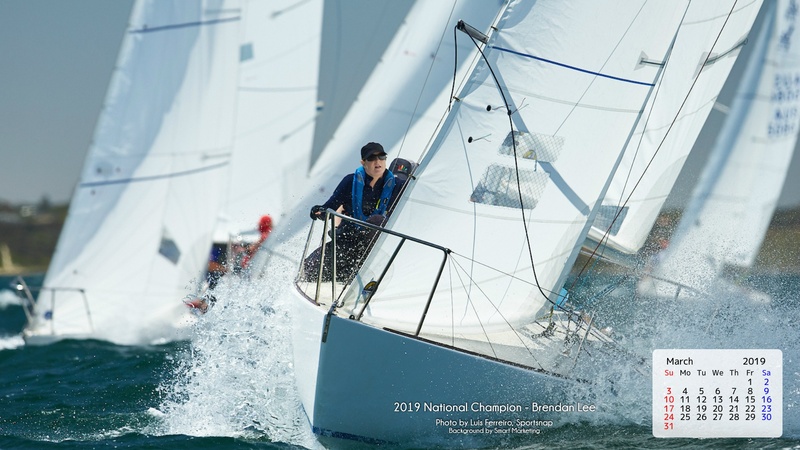 Congratulations to Brendan Lee and his crew on his Nationals win. Here is a precis of the champs from Brendan’s point of view. 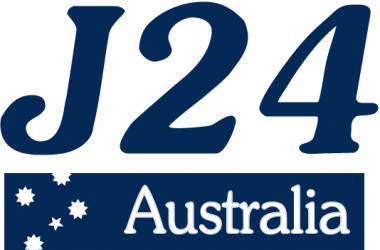 “After some confusion as to whether the 2019 J24 National Championships would be held in Adelaide or not, the Cruising Yacht Club of South Australia got behind the J24 class and hosted the championships from the 3rd to the 6th of January 2019. Whilst down on entrants from previous years the competition was just as fierce. 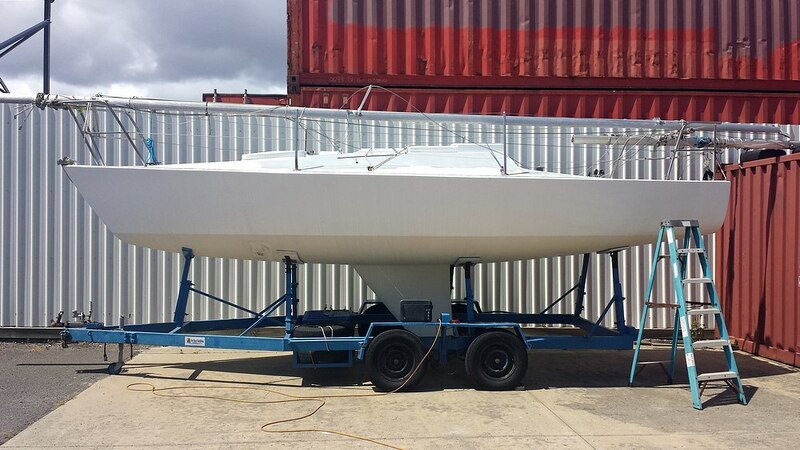 A special thank you to the 10 crews that travelled from NSW and Victoria. 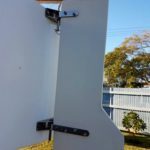 Twelve races were scheduled over 4 days of racing with the first discard coming in after race 8 and the second after race 10. 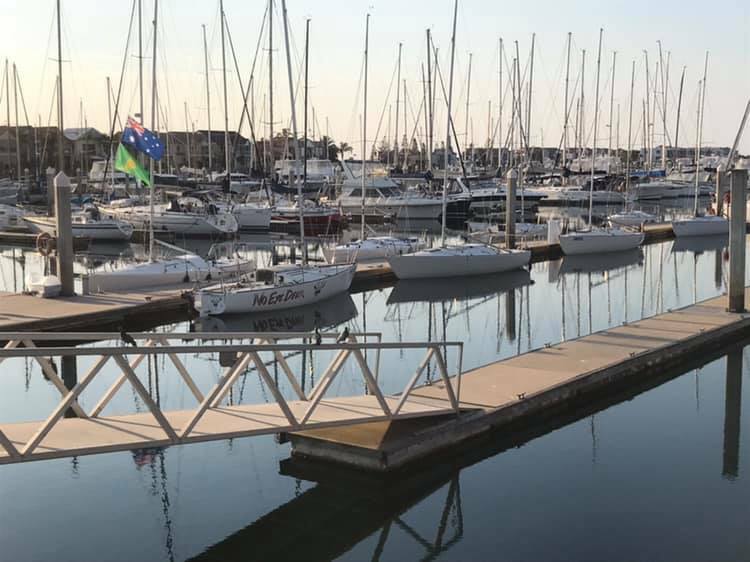 Day 1 and with a forecast top of 41 degrees, race management decided to put up the “AP” and keep the fleet in the shade until the sea breeze kicked in. Race 1 eventually got underway in about 6 knots of wind with the official sea breeze announcing itself part way up the 3rd leg with a massive starboard lift. Those that decided to go to the left gate and out to sea prospered. Those that did not, paid a hefty price, except for “Team El Fideldo” who charged out to sea and picked up the generous lift to record a bullet in Race 1. If anyone was watching from the shore they would have been curious as to why there was often someone hanging over the back of the boats. 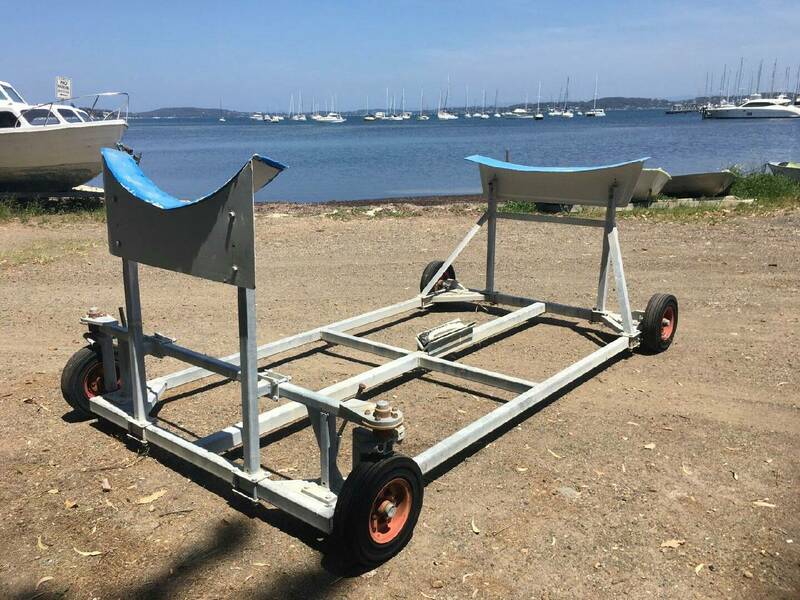 This was to rid seagrass from the rudder. 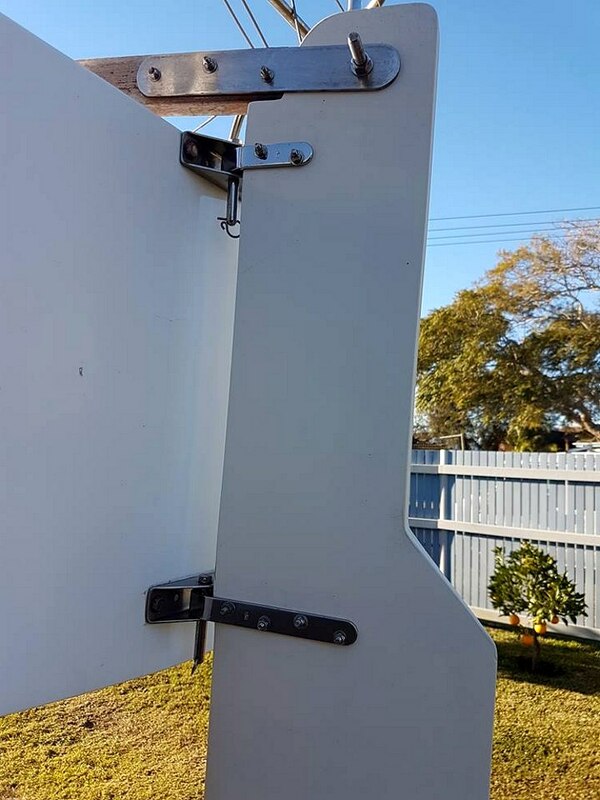 Unfortunately arms were not long enough so it was just a case of putting up with it and assuming that everyone was “in the same boat” so to speak. 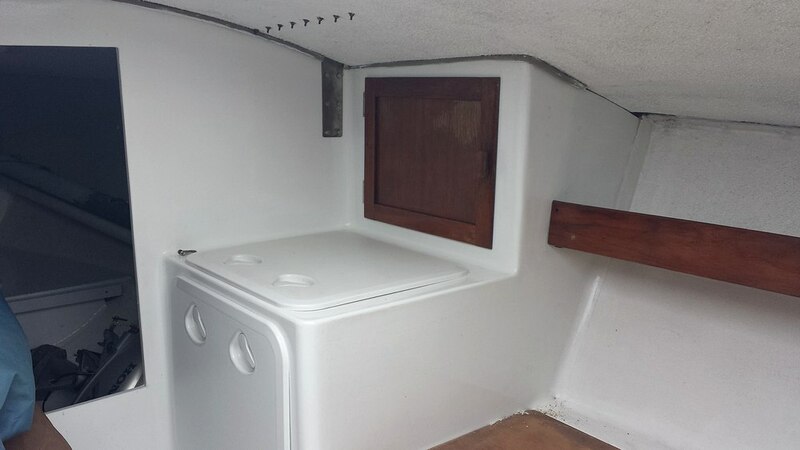 As for the keel, well there was little that could be done other than sailing backwards which would not only have been costly but likely pointless as it would have just been a matter of time until more accumulated. I understand “Wildfire” did infact execute the backwards move mid race. The following morning a number of brooms showed up on various boats with “Vice Versa” and “By The Lee” targeting the same Bunnings at the same time. With the first race out of the way and hopefully an early discard, the hammer went down and “By The Lee” picked up Race 2. 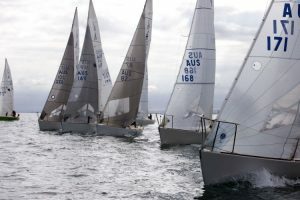 Race 3 and it was “Stamped Urgent” recording the win, successfully defending off “By The Lee” which at times were just 4cm behind and doing everything possible to get by. A shoulda-coulda moment for sure. 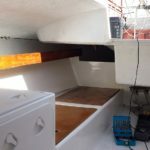 J24 One Design sailing at its best! 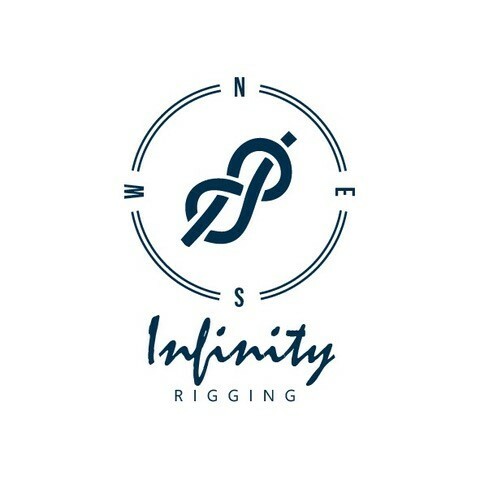 By the end of Day 1 and with 3 races sailed it was “Stamped Urgent” showing the way on 7 points with “Tinto” and “Two Dogs” on 10 points and “By The Lee” lying 4th on 11 points. 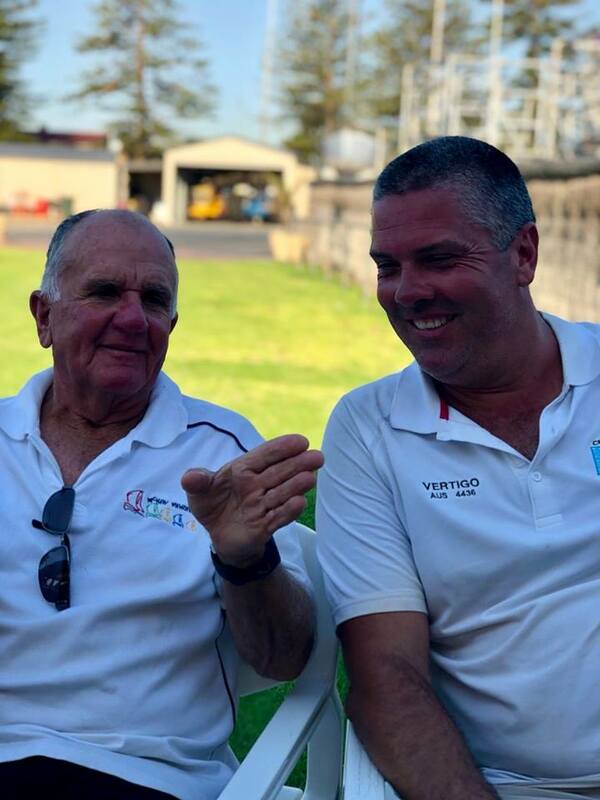 Following the day’s racing, it was the usual stories and banter about what coulda and shoulda been enjoyed over a BBQ put on by the South Australian Association. 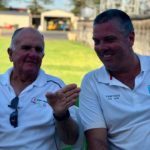 Thank you to Jim and Robyn for bringing it all together and Andrew and others for doing the cooking in almost 40 degree heat. 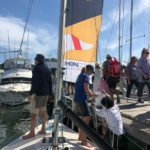 Sponsors “Dog Ridge Wines” joined the party by giving away 60 bottles of Rosé to be handed out to the top 3 places on ‘One Design’ and ‘PHS’ for each race and a new Genoa from Peter Stevens, representing a new Chinese Manufacturer “Loong Sails” for the median placed PHS boat overall. Day 2 and the forecast Strong Wind Warning was spot on. St Vincent’s Gulf was recording in excess of 25 knots. 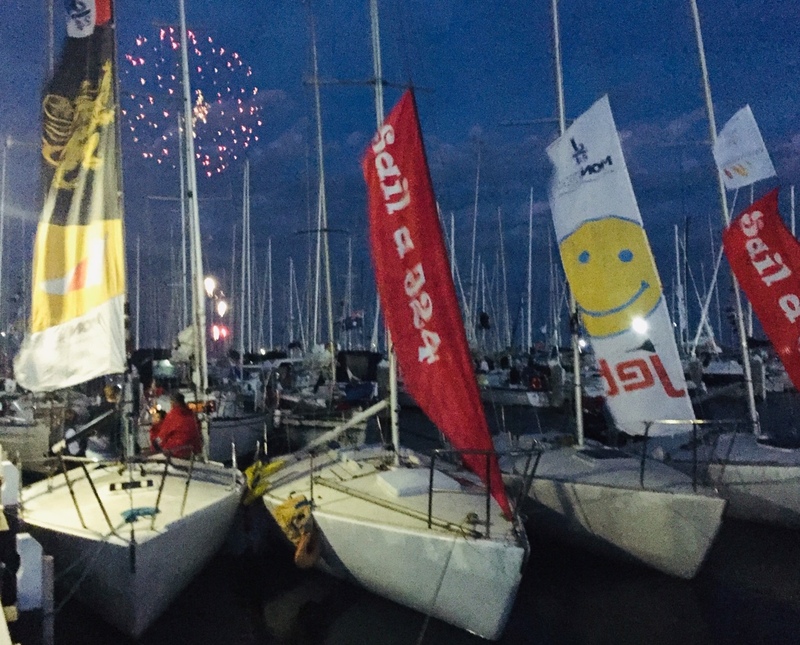 With no wind abatement in sight, race management called off the day and after just 3 races the fleet was rewarded with a lay day. Some chose to go to the wineries and others decided to race go-carts to blow off the adrenaline built up from Day 1. All in all it was in fact a great J24 community day with many teams coming together and having fun. 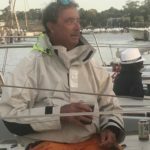 Day 3 and the wind had moderated to 12-15 knots. 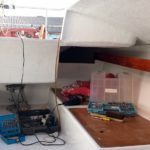 Race 4 was set in at 0.6nm, however I think the race officer underestimated the speed of a J24 and subsequently set Race 5 at 0.8nm and Race 6 & 7 at 1.0nm. 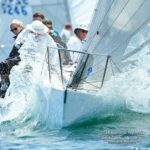 With a big incoming tide the upwind legs on the last race was seriously hard work. Race 4 and 6 were taken out by “By The Lee” with “Stamped Urgent” picking up Race 5 and their second win. Onto race 7 and the final race of the day and it was a new boat at the top “Wildfire” which I think started a few minutes ahead of the rest as this is how it ended up. I think Ron and the team were in the bar by the time the second boat crossed the line. Well done! So at the end of Day 3 it was “By The Lee” and “Tinto” at the top on 20 points with “Stamped Urgent” just 6 points behind. With Day 2 being blown out, race management decided to get things underway an hour early on the final day so the stage was set for a 10am start and up to 4 races scheduled. The championship was far from decided. 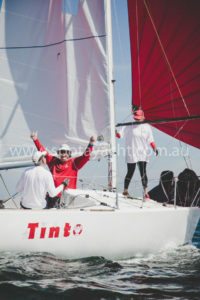 Day 4 and “By The Lee” knew what they needed to do….stay ahead of “Tinto” in every race. 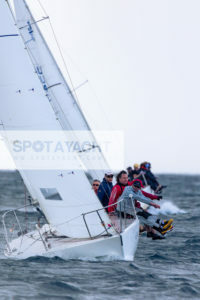 Race 8 got underway in about 8 knots of breeze it was “By The Lee” rounding the top mark in first place with “Tinto” a few places back. However in true Steve Wright style the competition was picked apart and in the end it was “By The Lee” followed by “Tinto” in second. 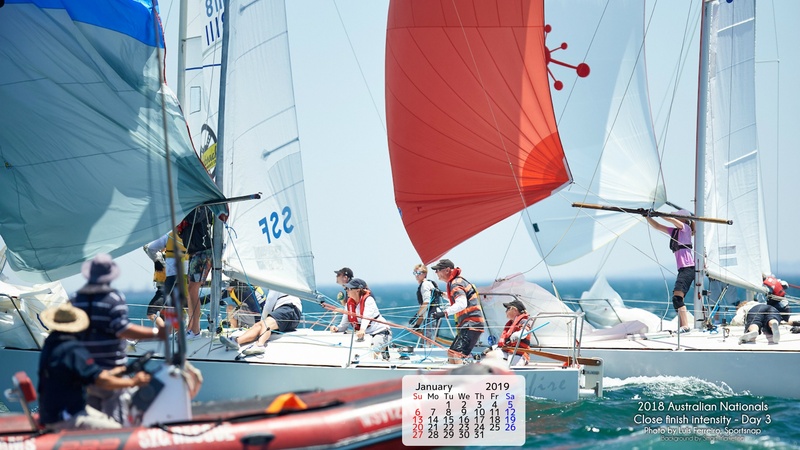 With 8 races sailed the first discard came into play and the finishing positions were starting to take shape with “Stamped Urgent”, “Wildfire” and “Two Dogs” all eyeing out a podium finish. 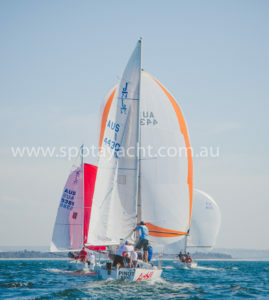 Race 9 and it was “By The Lee” first at the top mark however this was short lived after a massive spinnaker wrap which took a full 3 minutes to come free allowed “Tinto” and “Vice Versa” to sail through. 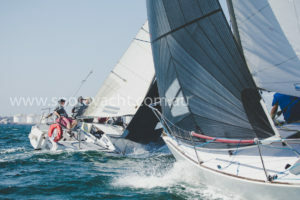 With “By The Lee” going toe to toe with “Tinto” for the entire regatta any placings between the two was huge so in this case it was +2 to “Tinto”. Race 10 and “By The Lee” had “Tinto” sucking dirty air off the line, however a short tack out to sea and back over to starboard saw “Tinto” cross the fleet which left “By The Lee” wondering what the hell just happened. “Tinto” recorded their second win and once again the gap narrowed by a further 2 points with “By The Lee” coming home in 3rd. 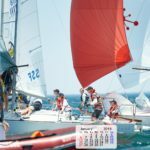 With 10 races sailed and the second discard now in place it was a showdown in the last race with just a two point spread between first and second place. A good upwind leg on Race 11 saw “By The Lee” round the top mark first with “Wildfire” hot on their heals. “Tinto” was a bit further back, but again this was short lived. 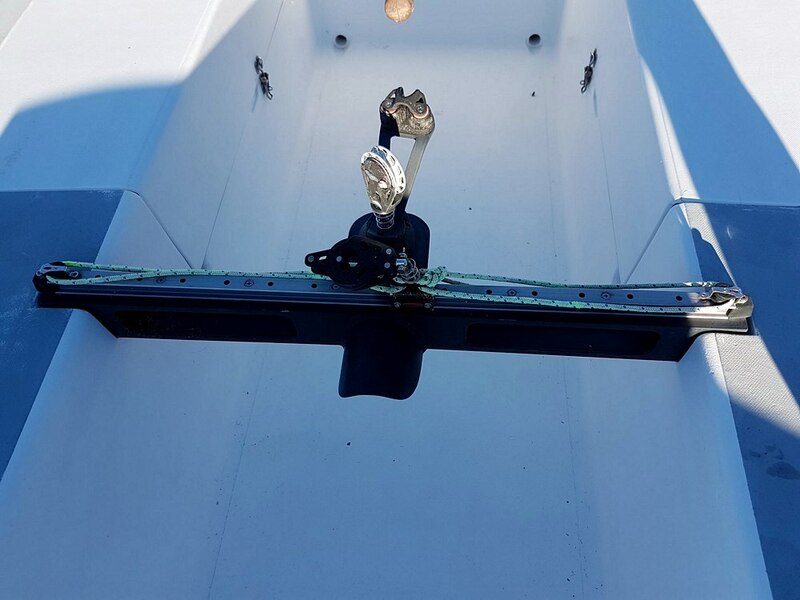 Another less than ideal spinnaker launch saw “Wildfire” sail over “By The Lee”. With a close eye on “Tinto”, defensive mode kicked in. 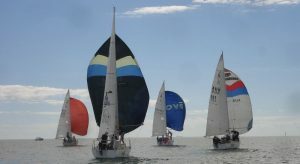 “Wildfire” extended their lead and the fleet closed in on “By The Lee” with both “Tinto” and “Stamped Urgent” getting past. Provided the gap was no more than 3 placings and a result of 5th or better, “By The Lee” was okay. 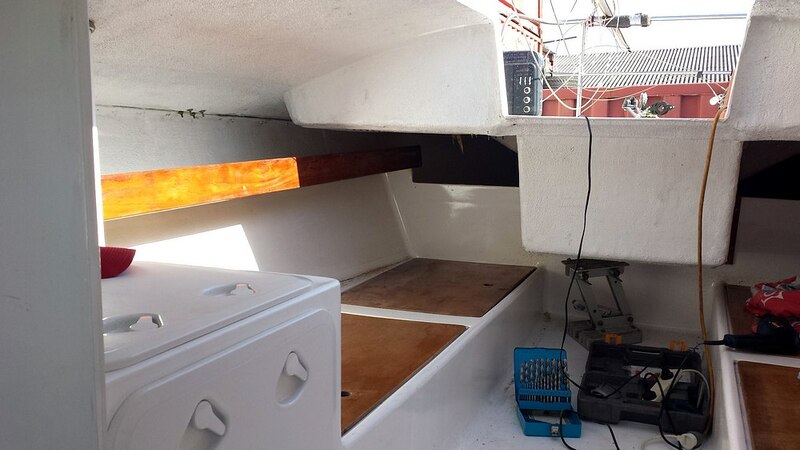 The next thing I saw was “Tinto” doing a gybe upwind which I later understood was as a result of contact being made with “Stamped Urgent”. With a generous port lift, “By The Lee” crossed ahead of “Stamped Urgent” and as a result of the penalty, “Tinto” was back in 6th. At the end it was “Wildfire” recording their second win, “By The Lee” coming home in second place and securing the championship with “Stamped Urgent” crossing the line in 3rd which also resulted in being awarded 3rd overall by one point over “Wildfire”. A very consistent effort across the 11 races saw “Tinto” drop their 6th place finishing second just 3 points behind “By The Lee”. And so it was onto to the prize giving with a traditional dinner overlooking the beautiful North Haven Marina. 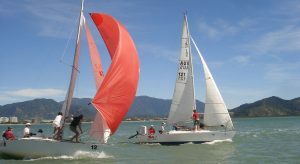 The last few bottles of Rosé were handed out and the winner of the Genoa was awarded to Jack Fullerton on “Two Dogs” who sailed an excellent regatta finishing 5th overall, just five points off the podium. 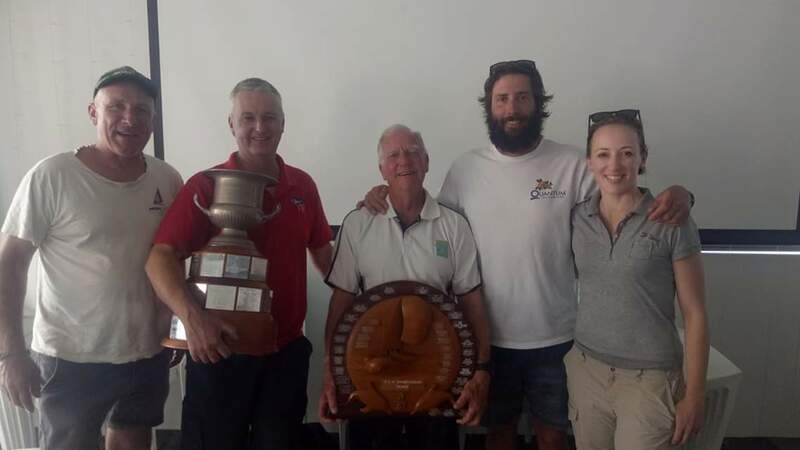 After 7 attempts, it was Brendan Lee, Rory Groves, Dan Cave, Peter Lee and Keren Reynolds on “By The Lee” picking up their first National Championships. In usual J24 style, the night went on with plenty of laughter and cheer. 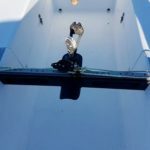 The 2019 championships was a great success. 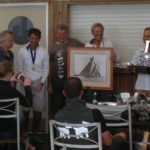 A special thank you to the CYCSA, J24 SA organisers and volunteers and to the sponsors “Dog Ridge Wines” and “Loong Sails” for their support. Thanks to Brendan Lee for his story. If you would like to contribute a story about the Nationals or pictures, please send it to me so I can publish it for you. 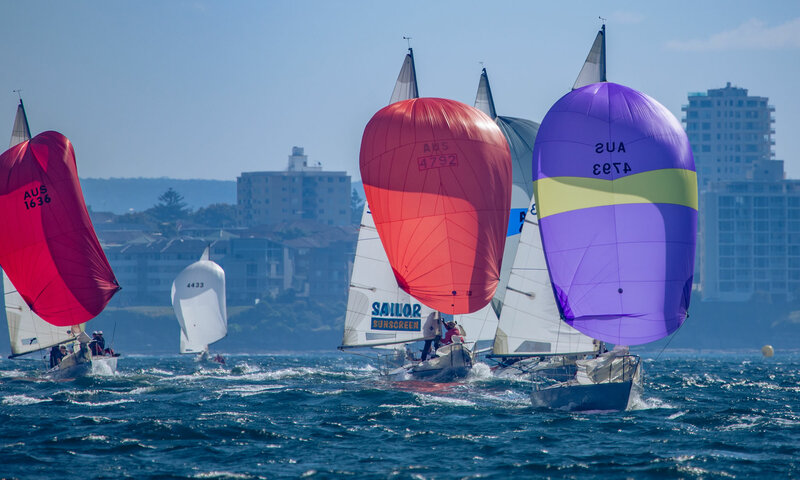 The Regatta was again hosted by the Cronulla Sailing Club racing in the waters of Bate Bay on Saturday and the Port Hacking Estuary on Sunday. 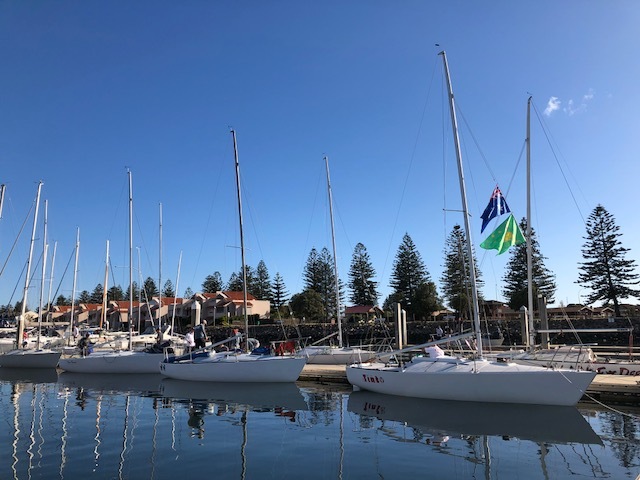 14 J24’s made the commitment with 5 hulls from the harbour, 1 from Botany Bay, and a crew from Melbourne showing the depth and strength of J24 racing. Day 2 and someone ordered wind right??? 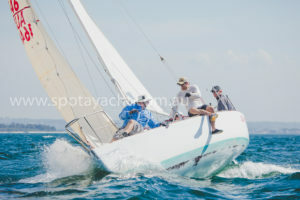 Race 5 saw the girls from Sandringham Yacht Club, with Kirsty Harris driving HYPERACTIVE win pole position followed by Mr Consistency TINTO and WOOD DUCK in third. Race 6 and WOOD DUCK popped to the top followed by again TINTO with INNAMINCKA in third. 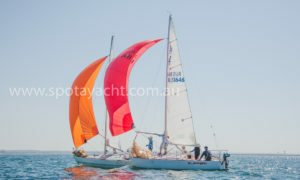 Race 7 saw WOOD DUCK again hit first, TINTO in second and STAMPED URGENT in third, Cronulla Boats 1, 2, 3. Final results, congratulations to Stephen Wright and TINTO first on scratch and handicap, Second on scratch was Class new comer Bryce Edwards in his dad’s J24, could be an interesting discussion leading into the States in November. Bryce also achieved 3rd on handicap. 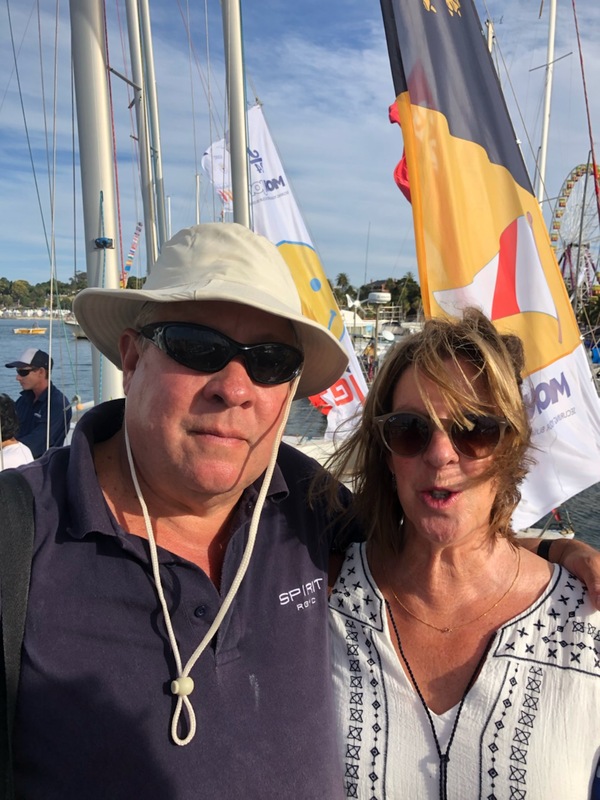 Second on handicap was J24 Southern Sydney Fleet President, John Zagame driving JARGON with third overall going to the forever young David McKay on STAMPED URGENT. 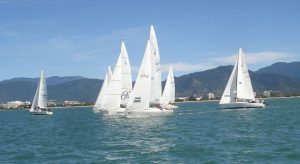 The FNQ J24 Championships were conducted by the Cairns Yacht Club over 3 days, 22-24 July 2011, on short inside harbour courses. 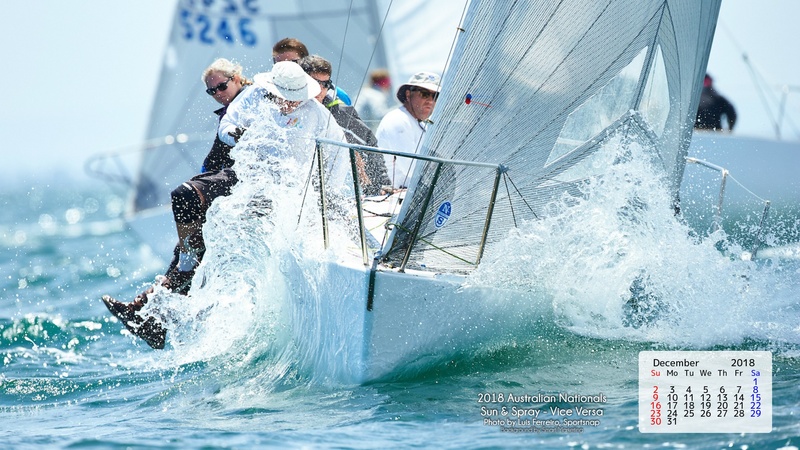 Morning races were light 5-10kt conditions with afternoon races sailed in 10-15kt breeze. 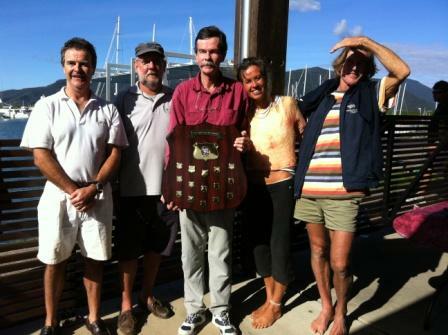 A total of 8 boats competed; 6 owned by NQ Sailing, 1 from Port Douglas Yacht Club and 1 privately owned. Kaizen 2 won the finals carrying a 2min. 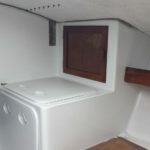 in 100min handicap as a dry sailed boat, over the rest of the fleet in clean wet sailed condition. 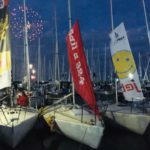 The 23 boat strong fleet of Canadian J/24 sailors were treated incredibly well by their host for the Canadian J/24 Nationals, Port Credit YC. 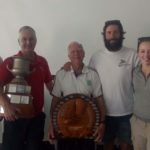 PCYC has to be one of the most gracious, fun-loving clubs on Lake Ontario, renowned for their “can do” attitude, excellent RC/PRO management of races and a club membership totally focused on having fun sailing. 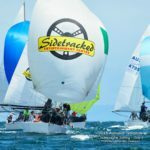 Note, this is the same crew that host the largest offshore race of the summer Lake Ontario season- the Lake Ontario 300 that starts this coming weekend. The 23 teams woke up Friday morning to light air, blistering sun and warm temperatures. 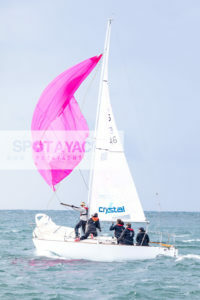 Nevertheless, the PRO managed to complete one race and then by 2:00 pm the wind shut off completely. The RC hoisted AP over H and the fleet went back to shore for shade, a dip in PCYC’s pool and re-hydration at the bar. 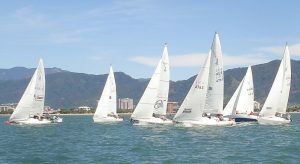 By 4:00 pm a line of wind was spotted coming over the lake from the south west, so the fleet headed out and were able to squeak one more race out of the day. 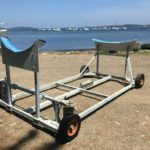 That’s awesome RC work, if you go to sail a Nationals, then be ready to go anytime! 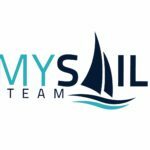 At the completion of Day one, it looked like Rossi Milev sailing CLEAR AIR/ ORANGE BLOSSOM was a leader to be reckoned with, scoring a 2-1 to lead over Peter Wickwire’s team on SUNNYVALE with a 1-3. Just off the pace was Tom Barbeau’s NAVTECH.CA with a 4-2. 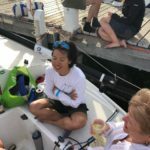 On Saturday, the forecast called for very light air and the fleet wasn’t too optimistic, however, the wind filled in and by 11:00 there was a solid 9 knots of breeze coming from the east. The Race committee started the race right on time to make the best of the wind while it lasted. 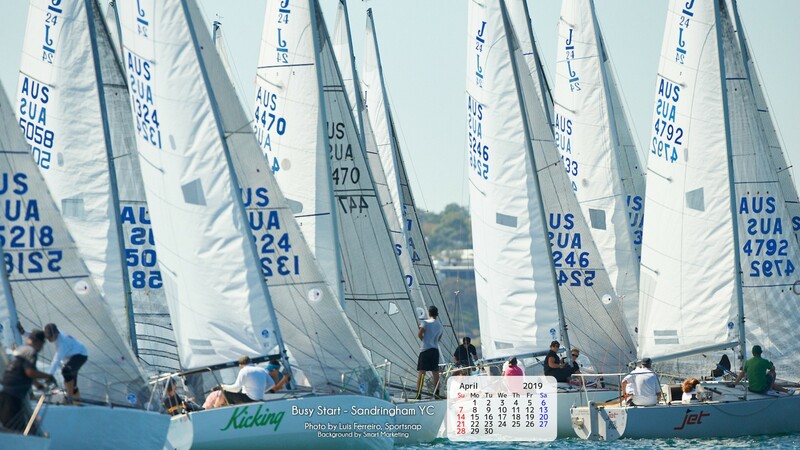 On the next 2 races, a persistent veer in the wind caused the race committee to put up ‘charlie’ plus green flags at the top end to indicate the leeward gates where shifted course-side-left. 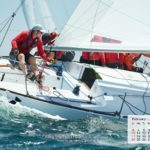 By the third race the wind had dropped substantially, but the waves & slop did not. The Race committee shortened the course and brought the windward mark to 0.9 nm. It was a hard slog up and down the course, and by the time the last boat had finished the fleet was exhausted. 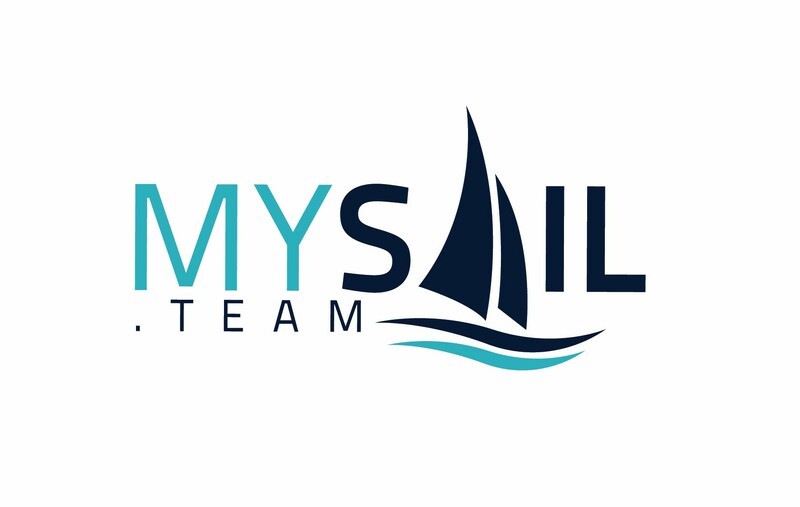 Still leading after this long day on the water was Rossi Milev with a 1-2-2 followed by Peter Wickwire’s SUNNYVALE with a 3-1-11 and Scott Weakley’s REX team working on the comeback trail with a 13-3-1. 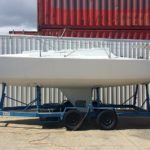 By 4:30 Saturday, the fleet was back on dock folding sails and finding shade. The wind had completely died so calling it quits when we did was the right call. 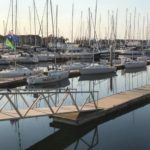 The fleet was definitely dehydrated and looking forward to the party Saturday night where PCYC put on a great BBQ spread with salads and deserts, and plenty of beer taps flowing. 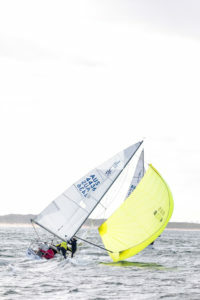 The Weymouth Olympic Sailing Center hosted their annual Weymouth Regatta that included the J/24 UK National Championship. 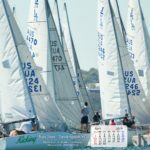 The organizers were blessed with beautiful weather, gorgeous breezes both days of racing for all. 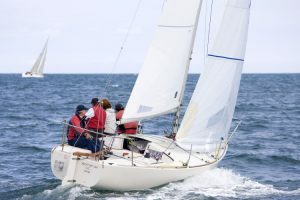 The J/24s showed up en-masse ready to do battle to determine the 2011 UK champion– several veterans showed up that included past J/24 UK Champions, like Stuart Jardine from Royal Lymington YC. 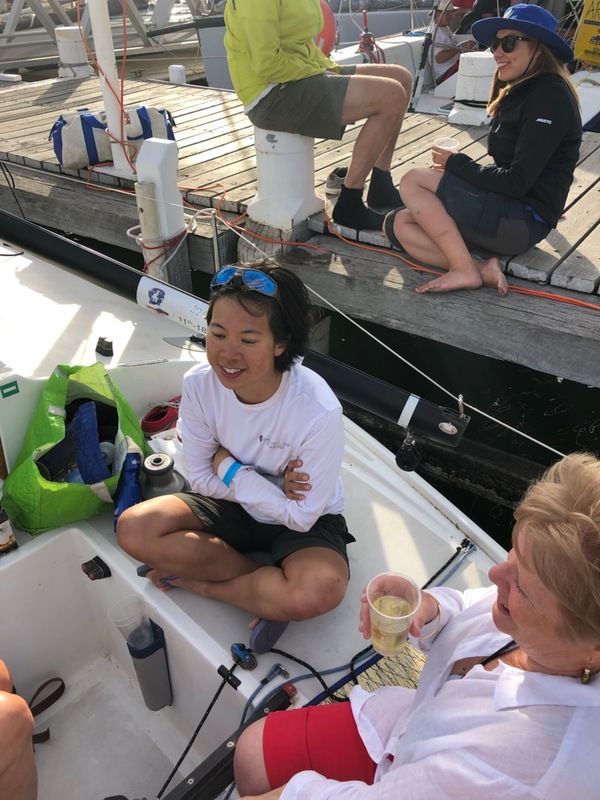 After the first days racing in the steady breezes punctuated by long wind streaks, it was self-evident that one team simply had everything dialed in to go fast, stay out of trouble and show their transom to the rest of the fleet. 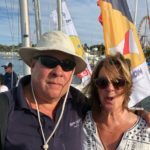 By day’s end, Bob Turner’s SERCO from Castle Cove SC simply smoked the competition, starting off with three bullets and a second to lead by a large margin. 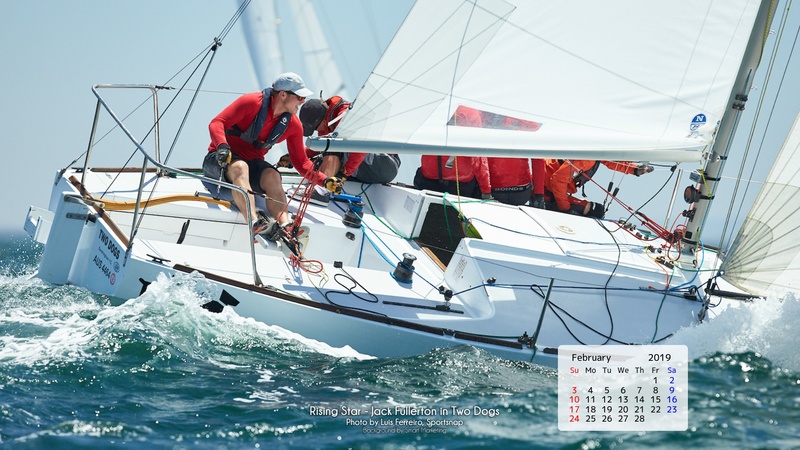 Nipping at their heels and still within striking distance was Mark Penfold from the RYA sailed RELOADED. Hi wins the South Australia Winter Series double! 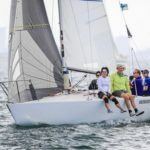 The One Design Division was a whitewash, with Hi scoring 5 points, and the second place Kaizen 2 scoring 18 points, with third-placed Cookie Monster following closely on 19 points. The PHS Division was hard-fought – Hi scored 9 points, Cookie Monster snapping at their heels with 14 points, and Kaizen 2 on 16 points, making it a slight rearrangement of the OD placements. 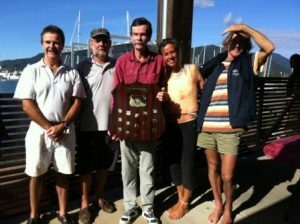 Showing the value of training and competing in as many races as possible, Hi took out both divisions. Cookie Monster demonstrated their practice pays off, and have two placings to show for it! The 2009 Victorian State Championships were held this weekend in typically light Melbourne autumn weather. 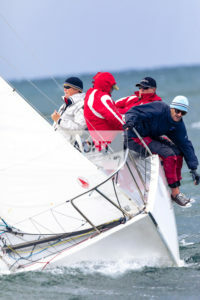 Breezes of less of than 10 knots made for challenging, but close racing. 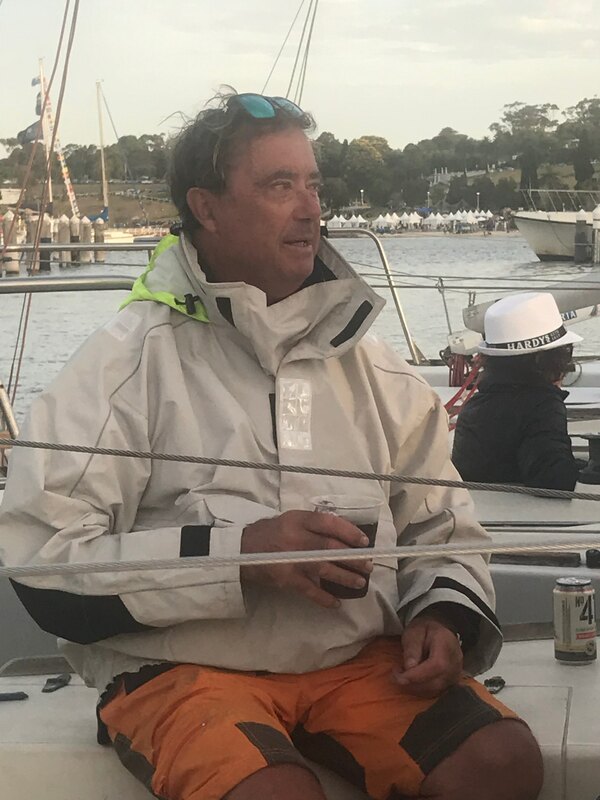 In fact the racing was so close that the regatta result was not determined until the last race and then only after multiple count backs as both Pacemaker (Herschel Landes) and Make My Jay (Simon Grain) finished with identical results (2 firsts, 3 seconds and a third). 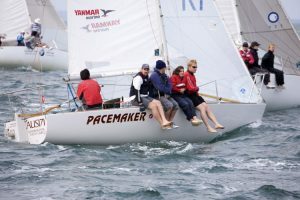 In the end, Pacemaker’s win in the final race gave them a second consecutive Victorian State Championship. 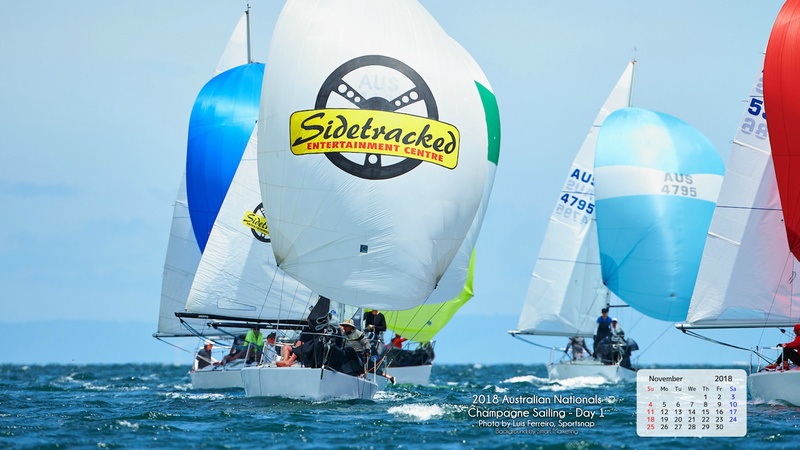 In another close battle, Hyperactive (Robyn Coombs) edged out the South Australian visitor Hi (Peter Stevens) to take third place for the second year running. Make My Jay got off to flying start, winning the first two races. 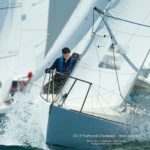 In both races they sailed the wind shifts perfectly to beat Pacemaker and Hyperactive in Race 1 and then Pacemaker and Hi in Race 2. Race 3 placegetters were the same as Race 2, but this time Pacemaker finished stronger to defeat Make My Jay and Hi. Race 4 was sailed in the lightest breezes of the day and Vertigo (Andrew Hely) sailed a great race to claim victory from Make My Jay and Pacemaker. At the end of Day 1 Make My Jay held a two point lead, and with two wins, it looked like Pacemaker would need to win both races on Day 2 to reclaim their title. 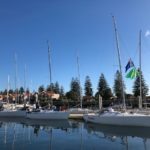 Day 2 delivered a consistent breeze of 5-10 knots from the SE and everyone was looking to get to the pin end and sail inshore in the hope of picking up lifts. 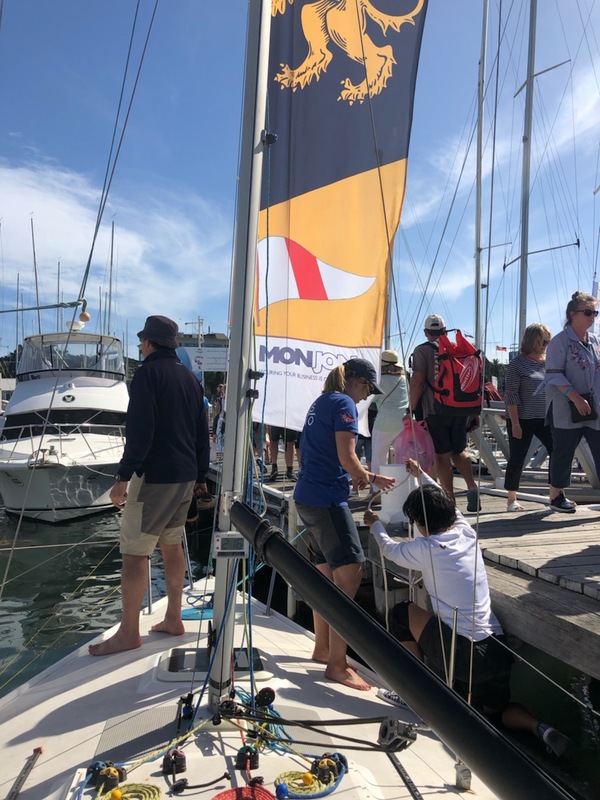 The girls from Hyperactive love these conditions and sailed a great race to record a win that would ultimately secure them their third place. Pacemaker and Make My Jay slugged it out and in their tightest finish Pacemaker picked up second by a mere 8 seconds. The final race was to decide the championship. Pacemaker knew they had to secure a second victory and hope that Make My Jay finished third or worse. Pacemaker got away to a flying start and with Make My Jay back a little in the pack it looked like they were headed for the result they needed. But not to be outdone Make My Jay worked their way through the field to pick up the second place they needed to tie up the series. With identical results no-one was sure who would be declared the winner. Whilst both Pacemaker and Make My Jay would have been happy to finish equal first the rulebook stated that in such a tie, the result of the last race would determine the winner. Pacemakers win in Race 6 not only leveled the series on points it was to win them the State Championship. 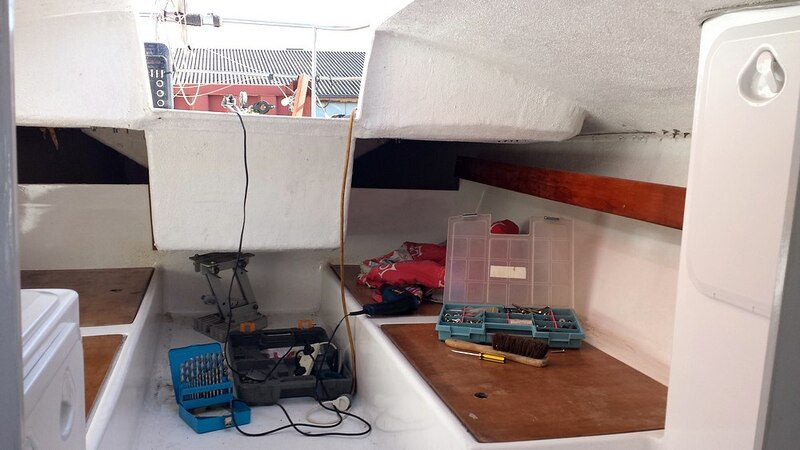 Of great interest to the racing was the provision of GPS trackers to all boats so that the entire regatta and fleet tracks can be analysed after the racing and individually on PCs in the future. 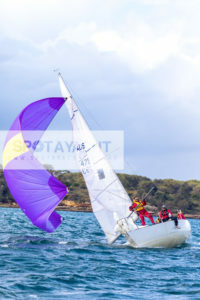 Thanks also to Steb Fisher for supplying the pictures of the regatta on this site. You can check out more on the album page. 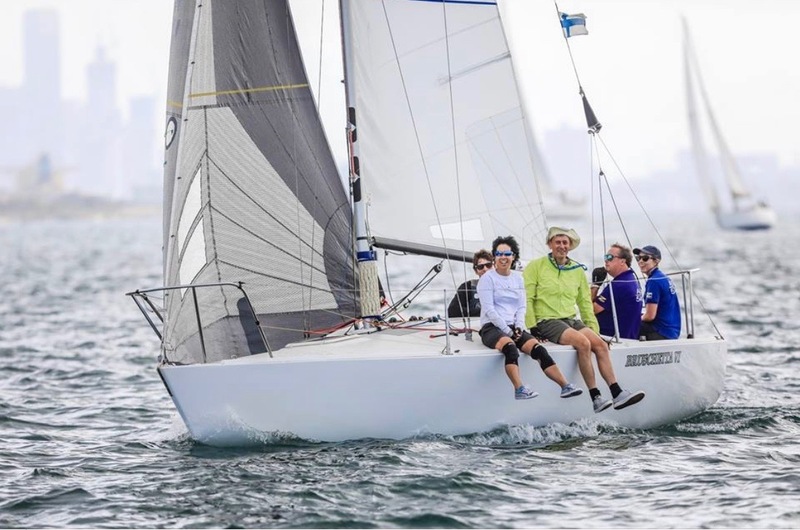 The result indicates a rise for the Victorian J24 group based out of Sandringham YC, with a number of new people entering the class the standard is improving dramatically and Pacemaker who finished 22nd in the last worlds in Italy now has serious competition for Victoria’s top spot. 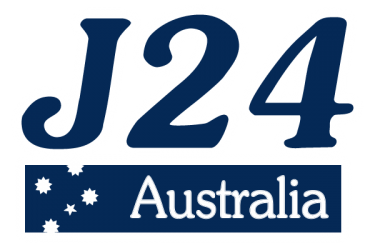 The J24 class is once again coming into its own as the alternative keelboat class to the Etchells in Australia. 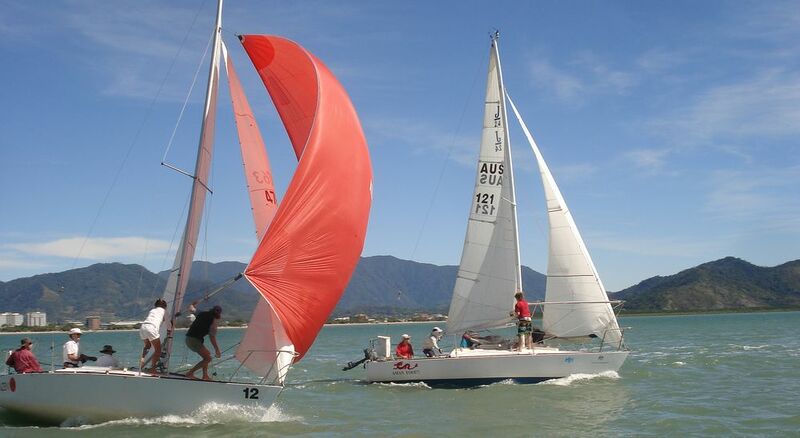 With around 6000 in the world the class has enourmous depth and world level competition. 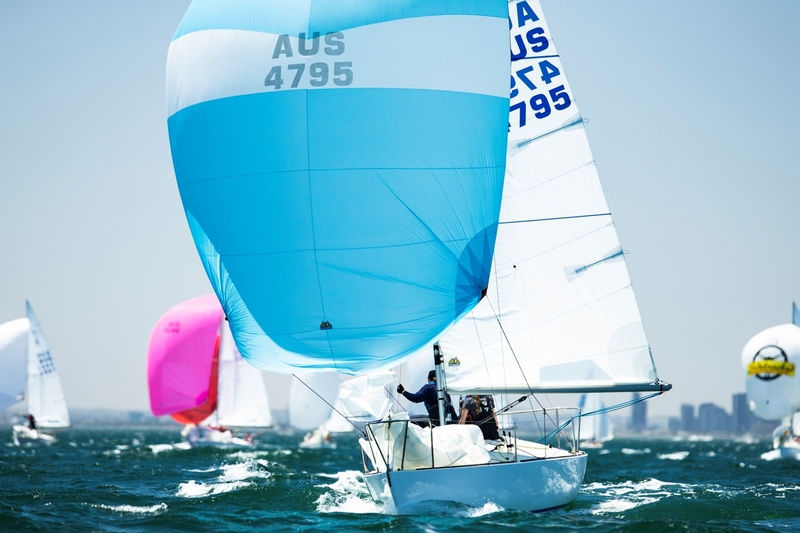 The next big J24 regatta is the Asia Pacific Mid Winter regatta in Adelaide over the Queens Birthday weekend, with over 24 entries including 3 overseas entries, it promises to provide an important step into the building of the future Asia Pacific series and also as a lead up to the next Nationals to be held at Sandringham in Victoria in Jan 2 – 8, 2010. 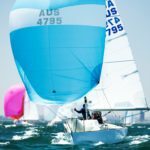 The S.A. State Championships were held at Adelaide Sailing club and sailed in 4 – 8 knts most of the weekend with plenty of windshifts. There was plenty of close racing with several heats only being won by 1 second. Good Company – Robin townsend and Vertigo – Jamie Goode were in the action all weekend but Fun2 consistantly played the shifts and kept to the middle of the coursre. 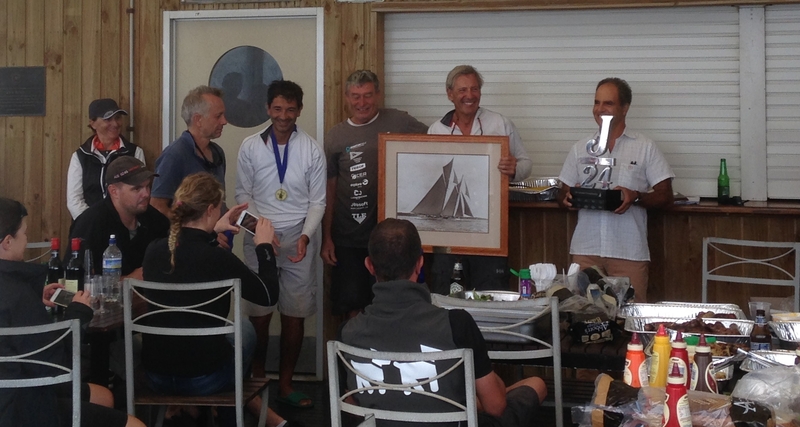 Congratulations to Fun2, skippered by Alyn Stevenson for the One Design AND Handicap wins!